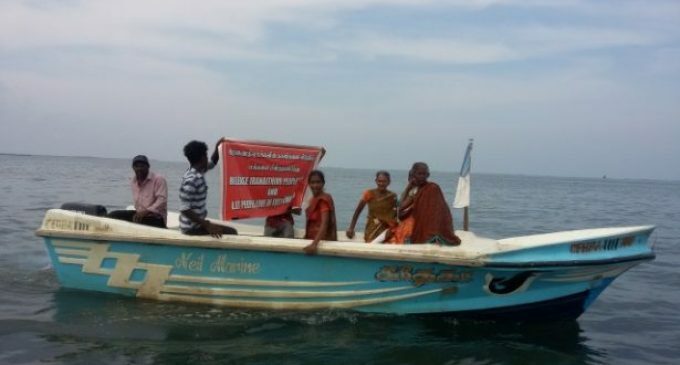 When a flotilla of 44 motorboats filled with 300 Sri Lankan Tamils — and a small group of activists, journalists and clergy — ignored the navy’s explicit orders and set sail for their former homes on the navy-occupied island of Iranaitheevu, they didn’t actually think they’d make it in one piece. “We were very, very scared,” said Elisabeth, one of the women who helped organize the initiative. At the very least, they expected the navy to prevent them from docking their boats on the island. Far worse, but also possible, was the navy opening fire and even killing some of them. After all, it had spent the past 26 years preventing them from returning to their island. What they did not anticipate the morning of their departure on April 23 — as navy officials and intelligence officers swarmed the mainland port and photographed their preparations — was meeting no resistance upon their arrival. Nearly three months later, 100 community members have permanently moved back to the island. After a quarter century of displacement, they have begun to rebuild the long-neglected, war-ravaged town. Their success was not a result of luck, nor did the navy have a sudden change of heart. Instead, a group of women from the community had developed and implemented a nonviolent strategy that closely resembles techniques implemented by professional civilian peacekeepers in conflict zones across the world. Sri Lanka’s civil war — which was fought between the majority Sinhala-dominated government and a minority separatist group, the Liberation Tigers of Tamil Eelam, or LTTE — engulfed Iranaitheevu in 1992, forcing all 650 of its residents to flee to the mainland. They spent the next 17 years in a state of constant displacement, relocating to different areas in northern Sri Lanka to avoid the fighting. The war ended in 2009 after the government implemented a scorched earth policy. It bombed hospitals, aid distributions and no-fire zones in LTTE territory to secure a military victory. The LTTE, meanwhile, refused to allow civilians to flee, in a futile effort to use them as human shields. The Iranaitheevu community was among the 350,000 civilians caught in the middle. After the war ended — in an apparent attempt to weed out any potential LTTE remnants — the government detained the Iranaitheevu community and the rest of the surviving civilian population in overcrowded displacement camps, which were rife with human rights violations, including sexual violence and torture. When the government released the Iranaitheevu community members from the camps six months later, they expected to finally return home. Instead, they found the navy was still occupying their island and had no plans to leave. The community engaged in political advocacy for the next seven years, but made no progress in convincing the government to allow their return. In May 2017, they began engaging in a continuous protest outside a church in Iranaimaatha Nagar, a port town and one of the closest points on the mainland to Iranaitheevu. Community members would alternate shifts, ensuring that at least a few protesters were always stationed at the church, holding signs that said “release our native land,” while also indicating how many days they had been protesting. However, a group of women — known as the Iranaitheevu Women’s Development Society, or WDS — soon began to suspect that the protest would not be effective either. They didn’t think — as a disaffected minority group in a remote part of north Sri Lanka — that a traditional protest would be able to sufficiently pressure the government into complying with their demands. Other displaced communities were carrying out similar protests, and most were having little success. Plus, with Iranaitheevu lying in a strategic military location along the Palk Strait, the navy seemed adamant about retaining control of the island. While the community never stopped protesting, the WDS began simultaneously planning another strategy to secure their return — one that wasn’t dependent on the government’s permission or the navy’s consent. It took them almost a year to prepare their strategy and gather the courage to execute it. The women were confident they could organize the logistics of their return — since most of the men in the community are fishermen and had motorboats to sail the 13 miles from mainland to Iranaitheevu. The harder part was figuring out how to make sure the navy didn’t attack them in the process. If they attempted to return alone, they feared the navy would retaliate. They would, after all, be in a remote location with no witnesses. It would be easy for the navy to get away with violence against unarmed civilians. With that in mind, the WDS set out to find a group of witnesses that could accompany them to the island. At the same time, these witnesses couldn’t be just anyone. They had to confer some degree of influence and respect — that way the consequences for retaliating would increase significantly and likely discourage the navy from turning to violence. In their search for strategic witnesses, the WDS recruited human rights activists (who could report on the navy’s behavior), clergy (who brought a degree of moral authority) and journalists, including a camera crew (who could document the entire event so that it could be shared with the outside world). With that taken care of, they then turned to designing the optics of the event. First, to ensure the navy couldn’t justify an attack on the pretense of self-defense, they tied white flags to each motorboat, signaling they were unarmed. Then they made signs with slogans such as “release the Iranaitheevu people’s land and let them resettle,” making sure to use large letters and all three of Sri Lanka’s languages. And when they sailed, they made sure that the flags and signs were clearly visible so that the navy could not mistake their intentions. When the community disembarked on Iranaitheevu, they were confronted by three surprised navy officers, who inquired about their intentions. One of the priests spoke up, having been assigned the role of negotiator, due to his pre-existing relationship with the navy. Politely, but firmly — and with the cameras still rolling — he informed the officers that the Iranaitheevu people were moving back into their homes, and that they would not be deterred. Unprepared to respond, the navy officers retreated, saying they would have to consult senior navy officials. At that moment, the community realized it had succeeded. “They cried tears of joy, and they ran into the church and started hymns,” said a nun who accompanied them and spoke on the condition of anonymity. The navy never made any subsequent attempts to expel the Iranaitheevu people from the island. Instead, three weeks later, the government granted the community official permission to remain, giving up its quarter century campaign to keep them from their land. While such a victory may seem unlikely or even just lucky — given the risk factors involved — the WDS actually employed a methodology developed and honed by civilian peacekeepers. Known as protective accompaniment, the practice involves positioning a respected third party to be visibly present in close physical proximity to vulnerable civilians in order to deter potential perpetrators from engaging in violence. The strategy is effective because it creates unacceptable consequences for engaging in violence — in terms of both practical repercussions and social disapproval. As an analogy, domestic violence is much more common in homes than in shopping malls, not only because potential perpetrators want to avoid legal repercussions, but also because they don’t want the other shoppers to think they are bad people. Protective accompaniment, in essence, makes vulnerable civilians safer by transforming their environment from a private home into a public shopping mall. Research in social psychology and neurology also helps to explain why protective accompaniment is effective in deterring violence: The human brain is wired to modify behavior to avoid social disapproval when it perceives that it is being watched by a third party. Some biologists have concluded that this tendency is actually a product of evolution, as our ancestors were reliant on social cooperation for survival. It turns out that this response is so ingrained that even the illusion of being watched causes people to be more cooperative. Various studies in different countries have shown that posting pictures of eyes in key locations can deter bicycle theft, motivate bystanders to pick up litter and incentivize people to make donations. Specialized civilian peacekeeping organizations like Nonviolent Peaceforce and Peace Brigades International, provide accompaniment to groups of civilians who are being directly targeted by armed groups, women in conflict zones who are vulnerable to sexual assault and human rights defenders who are under threat as a result of their work. Iranaitheevu appears to be a unique case for protective accompaniment, as the WDS recruited their own civilian peacekeepers, while also planning and directing the entire operation. As remarkable as their story is, however, political scholars like Casey Barrs and Oliver Kaplan have found that conflict-affected communities often develop sophisticated self-protection strategies, many of which have close links to civilian peacekeeping. Yet, such initiatives are often overlooked. When self-protection strategies are successful, people don’t get hurt, and the effect can appear to be much less dramatic than violence. We tell stories about violence and atrocities in an attempt prevent them from happening in the future, often in line with the “never again” mantra. But to effectively prevent violence, we must also tell the stories in which violence ultimately didn’t happen — for it is these stories that give us the guidance to make “never again” a reality. The post How Women Led a Peaceful Flotilla to Reclaim Their Island From the Sri Lankan Navy appeared first on MintPress News.